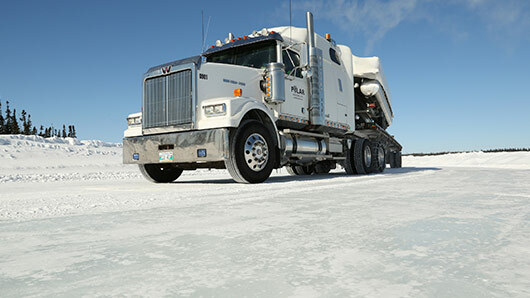 Ice Road Truckers, the reality series about some of the most dangerous jobs in the world, is airing its eighth on BLAZE. The series follows the daily activities of truck drivers in Northern Canada, risking their lives crossing frozen lakes in incredibly dangerous conditions every day. Series eight returns to Winnipeg and the compelling rivalry between Polar and VP Express, two trucking companies who compete for jobs in the area from season seven. This is the definition of an ‘extreme job’. Each day of the season, drivers risk their lives to complete jobs, travelling across the beautiful but treacherous landscape and dealing with a number of unimaginable difficulties. Watching people with years of experience demonstrate genuine nerves about the conditions highlights the high-stakes of this career path for the audience at home, creating an exciting season of television. Ice Road Truckers is a fascinating insight into a world so far away from ours. While the mere settling of snow on the ground may shut a big city like London down for a couple of days, these Ice Road Truckers are made of harder stuff. Each job is a suicide mission – and their ability to cope with the frequent difficulties they encounter is great television. Ice Road Truckers is an immersive series about everyday men with unfathomably dangerous jobs. It’s the perfect bit of escapism to watch while tucked up and warm at home this winter. Ice Road Truckers airs on BLAZE on weeknights at 10pm. Freeview 63.